School of International Studies, Jawaharlal Nehru University, New Delhi: It is the oldest university and includes M.Phil. And Ph.D. programmes in American studies, Latin American Studies, West European Studies, Canadian studies and many more, visit at http://www.jnu.ac.in/sis/. We have provided you the website links of the colleges where you can get more information about the colleges and their related courses. 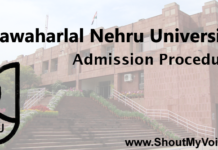 For further queries you can visit to the official site of Jawaharlal Nehru University: http://www.jnu.ac.in/.